SKU: WEATHS. Categories: Deck Finishes, Exterior Finishes. Tags: exterior finish, exterior protection, exterior stain, fortified with borates, oil-based, stain, weather seal, WeatherSeal, weatherseal exterior protection. There is absolutely nothing quite like WeatherSeal. Unlike typical thin & runny stains, WeatherSeal is thick and rich and easy to apply – not a mess like all the rest. Formulated especially for log homes, WS can be used over ALL types of outdoor wood surfaces where a natural wood appearance is desired. It’s an applicator’s dream: it spreads creamy smooth, there’s no pigment settling, and it soaks into the wood like a much thinner stain. Due to its thick consistency, you get more WS protection per brush stroke because more stain can be deposited on a vertical surface without dripping off. 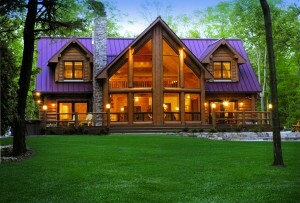 Beautiful wood-tone tints make your log home stand out. Multi-use formula for logs, siding, shakes, fences and decks. Suggested guide 3-5 years. Yearly inspection suggested. Re-apply as needed when wood shows signs of fading,chalking, flaking, etc. Special Note: In July, 2014, WeatherSeal was reformulated due to environmental considerations. The replacement ingredient provides a cleaner environmental profile. Previous customers will notice it is still very thick but not super thick as the previous formula. The core ingredients are the same. The color of an open container of the thicker version may look different than the newer thinner version due to the difference in thickness. Pigments have not changed and BOTH versions may be intermixed. Walls beneath porch overhangs will not dry as fast as exposed walls. Allow wood to dry for 3-5 sunny days before applying wood finish. Most finishes require wood to below a specific moisture content. Make sure to check the wood with a moisture meter before applying wood finish. will continue to work better a yearly maintenance cleaning is recommended. Mix Log Wash according to manufacturer’s directions on the container. Apply Log Wash from bottom to top with a pump up sprayer. Rinse with a garden hose and sprayer attachment. Mix 1 quart household bleach, 3 quarts water , ¼-½ cup trisodium phosphate and 3-4 squirts of dishwashing detergent like Joy® or Dawn®. Spray solution on wood surface. Wash solution off completely with a pressure washer at no more than 500 psi for best results. Do not allow solution to dry on the wood surface before rinsing. Failure to rinse solution off the surface completely can result in uneven coverage and streaking. Allow wood to dry 3 – 5 sunny days. Surface should not be damp. Walls beneath porch overhangs do not dry as fast as exposed walls. Do not apply WeatherSeal to wood over 18% moisture content. Applying two coats of WeatherSeal on wood with over 18% moisture content will create an environment where mold and mildew can grow beneath the surface of the wood finish creating peeling and lifting over time. Apply one coat of only of WeatherSeal over green wood or wood that has moisture content of 18% or more. Laminated logs: The moisture content of laminated logs is generally below 14%. These logs are usually ready for immediate application of WeatherSeal once they have been cleaned and allowed to dry for the appropriate amount of time. Always use a moisture meter to confirm the moisture content. Green, wet, or treated logs: These logs have moisture content greater than 18%. Allow the logs to sit in a dry area and check their moisture content on a regular basis. Logs with high moisture content can take up to 6 months to 1 year to reach the appropriate 18% or below moisture content for applying WeatherSeal. Wood preservatives ( borates ) make wood toxic to wood damaging organisms such as powder post beetles, carpenter ants and fungi. Wood preservatives do not protect against Carpenter Bees and other wood drilling insects, only those that ingest wood. Click here to find out about additives available for prevention of Carpenter Bees. Why apply a wood preservative before applying WeatherSeal? Applying a wood preservative can protect your home from damaging organisms for the life of the structure. WeatherSeal contains mildewcides, insecticides, water repellents and UV protectants; it is not a wood preservative. 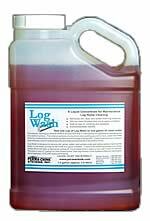 LogFinish.com recommends applying ShellGuard RTU or ShellGuard Concentrate to your logs before applying WeatherSeal. WeatherSeal may be applied over cured latex caulks without harm to the caulk. If possible, caulk first before staining with WeatherSeal. However , if applying a latex caulk or synthetic chinking over a WeatherSeal coated surface, lightly sand over the areas of WeatherSeal that will come in contact with the latex caulk or chinking to insure good adhesion of the caulk. Fill any spaces between the logs and upward facing cracks/checks in the wood after applying a wood preservative ( borate ) and before applying WeatherSeal. Fill all joints, cracks, and nail holes with a good quality acrylic latex caulk/filler created specifically for use with wood like Energy Seal or Check Mate 2 prior to applying finish. We always recommended performing a two coat color test to a clean, dry, bare area of the structure that you are planning on applying WeatherSeal. Please Note: WeatherSeal is difficult to remove once it has been applied. Before doing a full application make sure that your color selection is correct, has a look you want, and a maintenance schedule you can manage. Do not apply in direct sunlight, or if rain, snow, heavy dew or low temperatures below 40° F (4° C) are expected within 24 hours. If WeatherSeal is applied to close to rain or heavy dew, milky discoloration, streaking, spotting and wash off may occur. If exposed to excess moisture, without a sufficient time to dry, coating complications may also occur, involving longer dry and cure time and/or reduced adhesion to wood surface. WeatherSeal will change color as it dries, allow 8-12 hours in warm weather (70°). Final color appearance may take longer in cooler weather. WeatherSeal is a one or two coat application on clean, dry, bare wood with moisture content below 18%. Any more or less than two coats will lead to peeling and decreased durability. For wood already coated with WeatherSeal, it is a one to two coat maintenance coat depending on weathering. Please see the WeatherSeal Maintenance section for more details. Because of WeatherSeal’s unique chemistry, a color change will occur with WS when it is wetted. In areas where water puddles accumulate (from rain, dew, sprinklers, etc.) on the dried stain’s surface, WS will temporarily turn to a lighter milky, hazy color. Once the water dries, WS will return to its normal color. Over time, this “water-spotting“phenomenon will diminish and will be barely noticeable. Nothing is wrong with WeatherSeal, nor is its performance compromised when this color change occurs. It is only temporary and of course it is most noticeable on flat surfaces where water puddles. The color change is most extreme when WeatherSeal is recently applied. Buy sufficient product for the whole job and intermix full and partial containers together before starting to ensure color uniformity. Mix thoroughly with a paint drill mixer. After creamy, consistent texture is reached, mix for 4-5 minutes more to ensure product is thoroughly mixed. Do not thin unless necessary for application. If necessary, dilute with mineral spirits up to 8oz per gallon of WeatherSeal only where air quality regulations permit. Apply between 50° F (10° C) – 90° F (32° C). Wood surface temperature must not be 50° or below or 95° or higher. Do not apply in direct sunlight, or if rain, snow, heavy dew or low temperatures below 40° F (4° C) are expected within 24 hours. If WeatherSeal is applied to close to rain or heavy dew, milky discoloration, streaking, spotting and wash off may occur. If exposed to excess moisture, without a sufficient time to dry, coating complications may also occur, involving longer dry / cure time and/or reduced adhesion to wood surface. Brushing is the best method of application. Use a synthetic bristle brush. Roller application is acceptable for rough sawn surfaces and T1-11 siding, for best results, use a ¾” knit polyester/wool blend roller. Airless sprayer application is also acceptable when there is access to a professional sprayer with a .015-.017 tip and 1500-2000 PSI. WeatherSeal must be backbrushed after sprayer application. Apply one even coat, following the wood grain pattern of WeatherSeal, avoiding heavy application. Any excess stain should be brushed smooth to avoid uneven application. Apply second coat of WeatherSeal. Make sure you are applying a 2nd coat of WeatherSeal over a fully dry first coat. The 2nd coat will not appear smooth or even if the 1st coat is not dry. Apply in the direction of the To avoid lap marks, start at one edge and follow through to the end of each board or log, maintaining a wet edge. If applying two coats, put insect additives in the second coat. Do apply over cured latex caulk. Do assure air temperatures are between 50 degrees and 95 degrees Fahrenheit. Wood surface temperature must not be 50° or below or 95° or higher. flat surfaces where water puddles. The color change is most extreme when WS is recently applied. When WeatherSeal is showing signs of wear and no longer effectively protecting the wood surface, it is time to re-coat. 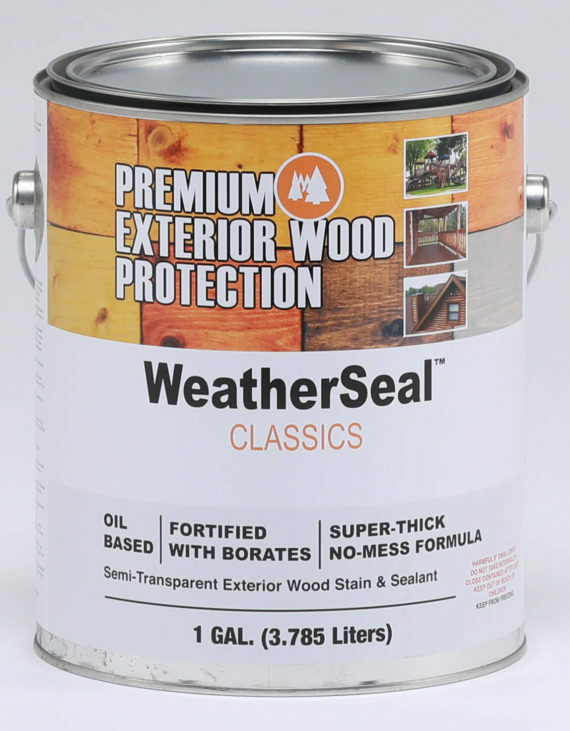 Depending on the severity of the wear, 1-2 coats of WeatherSeal in the same previous color are recommended to effectively restore and protect the wood surface. As always the wood surface must be properly prepared prior to application to insure best performance. To prolong the natural look of WeatherSeal, it is important to only pressure wash and apply a maintenance coat when it begins to show obvious signs of deterioration like fading, chalking or flaking. Those areas that reveal bare wood or show signs of deterioration should be washed with log cleaner, rinsed completely with clean water, and once dried lightly sanded with 180-220 grit sandpaper and then touched up with the same color. Wash the wood surface according to Maintenance Cleaning directions stated above. Buy sufficient product for the whole job and intermix all product together before starting to ensure color uniformity. Do not apply in direct sunlight, or if rain, snow, heavy dew or low temperatures below 40° F (4° C) are expected within 24 hours. If WeatherSeal is applied to close to rain or heavy dew, milky discoloration, streaking, spotting and wash off may occur. If exposed to excess moisture, without a sufficient time to dry, coating complications may also occur, involving longer dry and cure time and/or reduced adhesion to wood surface. Brushing is the best method of application. Use a synthetic bristle brush. Roller application is acceptable for rough sawn services and T1-11 siding, for best results, use a ¾” knit polyester/wool blend roller. California Orange County Air District. Shipping to Canada is permitted. However, orders will be drop shipped from the manufacturer with bilingual labels on containers. Stain is excellent. Have applied it at numerous times in 13 years for my log home built in 2004. The only negative comment I have is I have to touch my log home up with it annually. When sleet or hail hits my log home it continually chips down to bare wood and stain flakes off , Every year I have to restain most of my home that gets hit with bad winter weather. Any advice or assistance from others greatly appreciated. I am getting much older now and it is getting harder each year to keep restaining. Thank you! Just bought another five gallons of weatherseal cabin brown for a third go around on the cabin in sixteen years. We’re in the northern Wisconsin and siding takes a beating. No better product out there for semi- transparent stain bare non. My only critique is that it shows brush marks on smooth surfaces like the tongue and groove pine soffits, but beautiful on rough hewn cedar siding which is the majority of surface area. Easy to mix and apply. Looks great! Thank you for submitting your review! We appreciate your feedback. 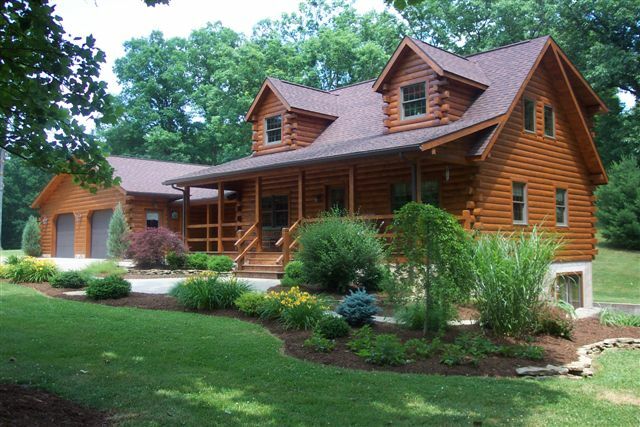 We used WeatherSeal Exterior Wood Finish in the Autumn color on our log home 1 year ago and it still looks great. When we opened the can it looked a little more orange then we thought it should be but after applying it looked beautiful. Of course it will darken over time. It is very thick but easy to apply. We applied with brushes and it blended great,no lines or streaks. I would recommend this product to anyone that is considering staining their log home. Thank you for the WeatherSeal review. We appreciate your feedback!